Watch Dogs is exactly what you think it is. It’s Assassin’s Creed 4 meets GTA 5 meets Batman Arkham City… but--despite the pedigree of its influencers--it narrowly fails to better any of them. Don’t misunderstand: it’s a great game that combines some smart ideas with an innovative setting, but it’s also one that arrives exhausted from its cross-generational birth. There are some wonderful moments and features in Watch Dogs; but also plenty of tired tropes and trappings that should’ve been left firmly in the past. The plot focuses on the high-tech exploits of Aiden Pearce, hacker and self-styled vigilante. He’s a bit of a dullard, really, and prone to occasional bouts of hypocritical self-reflection (in between shooting men in the face, and running down hobos). Before the action starts we learn that Pearce and his partner Damien get involved in a risky hack job at a hotel, a mission that goes hideously wrong and ends up with an unknown villain retaliating against Aiden. His niece, Lena, dies in the crossfire and so begins a classic tale of one man’s quest for answers / revenge. For all the game’s reliance on tech, it’s the basest of human emotions that drives the story forward, which is either a clever nod from the developers or a lucky coincidence. Ubisoft Montreal, I’m giving you the benefit of the doubt on this one! Story-wise, the game is mostly dud. All the characters are unimaginative stereotypes, with thin motivations and forgettable personalities. Hacker chick with piercings? Check. Sinister, elderly villain? Check. Gang leader with a stupid name? Check. The plot itself is a mixture of predictable twists, dressed up with strange leaps of logic and enough technobabble to make Bill Gates soil his beige chinos with delight. However, while the overarching narrative is forgettable, there are some delightful set-pieces and micro-plots to discover. These more than make up for predictable story-beats. One mission has you searching for a secret bunker on an abandoned island, close to the city centre. The stirring Vangelis-style music mixes with a glorious in-game sunset to make it feel as if you’re genuinely uncovering a secret new world, right in the heart of the urban sprawl. Another neat little moment has you searching for a rival hacker in a nightclub. No spoilers here, but he turns the hacking system back on you, and changes the info you see when you scan other club-goers. It’s a wonderful role reversal, making you feel powerless, and forcing you to question Aiden’s motives much more than any downbeat monologue ever could. So you’ll enjoy Watch Dogs’ narrative in piecemeal, rather than as a whole. At first glance, the game’s setting appears as shallow as its inhabitants. Chicago is a lively mixture of skyscrapers, slums, and the token ‘countryside’ bit--sadly inferior next to the wonderfully colourful, sun-drenched San Andreas of GTA 5. Look closer, though, and the city’s true beauty becomes apparent. It’s densely packed with details, hidey-holes, and some utterly dark secrets--many of which you only start to discover once you start poking around side-missions and optional quests. Perhaps my favourite moment in the whole game happens when I cause a mighty car crash, and see a couple of ghoulish pedestrians taking videos of the carnage on their phones. It really brought the game alive for me. The only real reservation I have about Watch Dogs’ Chicago is that--during the majority of my 40+ hour playthrough--it was either dark or dull. In rare moments of sunshine the game looks beautiful, really showing off its new-generation credentials. It was vital to pack so much into Chicago itself, because the city is intrinsically linked to how this game plays. Unless you’ve been living under a hermit, who has been living under a rock, for the past three years, you know that Aiden’s phone can hack various things within the environment. This is what separates Watch Dogs from other open-world games, and it isn’t just a gimmick: it’s integral to everything you do. Hacking cameras, for example, lets you probe and explore every inch of the city. There are cameras EVERYWHERE, and you can--if you want--traverse huge in-game distances by hopping from one hackable device to the next. It’s hugely liberating, and provides loads of strategic gameplay options. One sweet example happens when another player invades my game to try and hack my phone for secrets and cash. Instead of rushing after my attacker, revealing my position, I hack the cameras and jump between them until I’ve profiled him. I then quickly, quietly flank his hiding place before terminating his intrusion with a shotgun shell to the brain. Good night, and a truly unique Watch Dogs moment. Forklifts aren't just convenient tools for climbing hard-to-reach ledges; they're also great distractions for enemies. You'll be doing a lot of running from cops. Spend skill points early on to level up your city hacking capabilities, especially the points that temporarily disable helicopters. These go hand in hand with city hack skills--be sure to increase the durability of your vehicles to survive long-winded chases. This should go without saying, but side quests reward you with cash and valuable skill points. Don't pass them up! The well-implemented multiplayer is a great way to level up early on. Take advantage of the opportunity. Aiden can craft lures and jammers, both of which are incredibly useful tools--don't ignore them. Some of Watch Dogs' best content isn't a part of the main story; be sure to spend some time checking out everything else it has to offer. Being a vigilante means breaking the rules. Scan citizens to see if you can hack their bank accounts for fast money. A quick note on gunplay, then. It’s satisfying and robust enough to be a genuine option for most scenarios (some missions ask you to avoid detection, so er, easy on the shotgun blasts, yeah? ), even if hacking and stealth are often the more obvious scenarios. Yeah, it’s fun to shoot someone in the head, but it’s even more satisfying to hack an enemy’s grenade while it’s still hanging from his waist… Boom. Towards the end of the game you’ll be savvy enough to combine bullets with hacks, decimating rooms filled with grunts--it’s a great feeling when you really bring it all together. Aiden’s delightful phone (which never seems to need recharging, oddly) can also digitally steal cash and secrets from anyone in the city. It can overload power-junctions, move forklift trucks, and even vent clouds of gas from Chicago’s pipe network into the sky. While the act of using it is as simple as holding a single button, its functions are myriad. It’s admirably simple to use, even if sometimes you’ll end up raising a barrier instead of opening a door. Generally the context-sensitive commands work extremely well, though. Vehicle handling is very heavy in the game, and unless you hop on a bike or high-end sports car, most rides feel the same. That’s no bad thing, as you’re less likely to fishtail out of control when you’re fleeing the fuzz. It’s also a little less twitchy than other open-world games to make on-the-road hacking easier to do--a welcome trade-off. There’s an immense joy in zipping through traffic lights, hacking them, and watching your pursuer smash into the confused drivers behind you. It’s so satisfying, that the game even cuts to a crash-cam when you’ve timed it to perfection. Good job, really, because you’ll spend a lot of time in the car as Watch Dogs reaches its conclusion. Linear ‘do something, get chased’ missions become more frequent in the closing hours of the game, and instead of trying anything truly new to test the player’s skills, these stages simply ramp up the difficulty to patience-killing heights. Top tip to avoid putting your controller through your TV: unlock the perk that disables the police helicopter ASAP. There are loads of abilities to unlock as you progress, all of which expand your skillset, but I recommend maxing out your hacking as soon as you can. Luckily, there’s plenty to fiddle with outside the main story, and it’s here where Watch Dogs really shines. There are 100 HotSpots dotted around the city, and checking into each one allows you to collect rewards (like money), and leave gifts for other players. Each HotSpot has a mayor--4Square style--and some hand out special badges. It’s a wonderfully creative way to approach collectables. Elsewhere, the investigation side-stories highlight the more interesting aspects of Watch Dogs’ world. One has you tracking a serial killer, while another tasks you with busting a human trafficking ring. Silly mini-games like Chess, Coin Run, and Poker? Yeah, they’re all here and they’re all perfectly OK. Juuust fine. Then there’s the multiplayer, which is incredibly well implemented. Most features are integrated into the single player, and you get a pop-up message allowing you to accept or deny invites. Nice touch--sometimes you just want to be left alone. If accepted, other players enter your game to play one-on-one hacking games, races, or police chases (via the companion app). While multiplayer activities are slightly different to solo missions, they feel well connected to the overall experience. I mean this in the best way possible: it’s as if you’re not really playing online. There’s no disconnect, no server hassle… just the tension of playing cat-and-mouse with a real human opponent. It’s these state-of-the-art thrills, combined with a genuine desire to investigate and fiddle with every inch of Chicago, that’ll push you to play until the bitter end; until the game has spilled all its secrets. The story is unlikely to keep you logged in, and the missions will often feel annoyingly familiar, but if you connect with and really explore this high-tech world, there are plenty of virtual--and emotional--rewards to harvest. 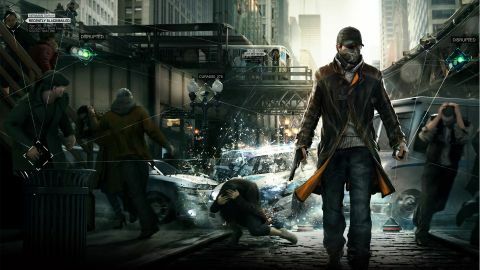 Description In Watch Dogs, players enter the dangerous world of Aiden Pearce, a new class of antihero whose ability to hack into any connected system could be his most powerful weapon.